Here is an easy way to save some time and money this year when you are planning your New Years Eve party. This template will make you hundreds of New Years Eve Invitations in no time and have your party advertised all over the place. Here is a step by step walk through of how to use this template and a couple tips to add a little more fun. Once you have downloaded and opened the file, you should see the outline of what you want on the screen in software that is compatible with Publisher 2007. 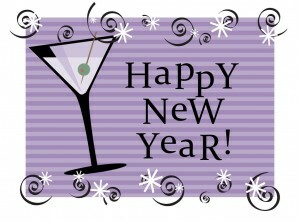 The invitation states Happy New Year with a martini glass beside it. Decorations adorn the top and bottom as well. You can add any information you want to this template to make it suitable for your get together. Information it should contain is the date you are holding they party, the time it starts, the address of where the party will be held, and a phone number or e-mail address that the recipient can return an RSVP. Once you have all this date entered where you want it, your New Years Invitations are ready to print and be sent out. If you cannot find room in the body of the New Years Eve Invitations to fit the information you want to add, think about making a back to the document with a greeting and all the information that the recipient would need. This would make it seem more personal and would not get overcrowded like it would on the front. You could put your signature at the bottom to make it feel authentic. Play around with some ideas and see how they look before making your final decision. Then, when you are ready, print out all the invitations you want to send out. The New Years Eve Invitations template is so easy to use and can get you to sending them out in no time. Download it from the link below and use it for your next get together to celebrate the new year.